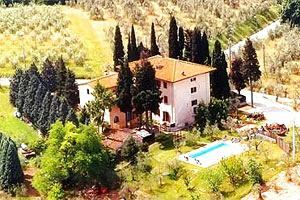 Surrounded by olive groves and vineyards, the villa (20/22 beds) stands in panoramic position atop a hill offering a magnificent view of the Tuscan countryside stretching as far as the eye can see. 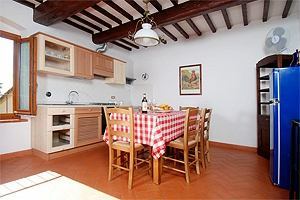 The 19th-century villa is surrounded by a wide fenced garden with swimming pool, furnished with sunloungers and sunshades, and barbecue equipment, for pleasant meals in the open air. In the past, the small chapel of the nearby monastery of the Calvane nuns stood on the estate. The chapel housed the painting called "Madonna della Neve" (Our Lady of the Snow), to which the building was dedicated. 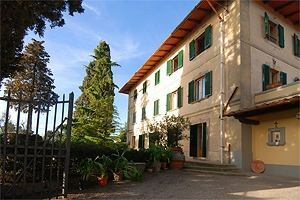 Numerous panoramic pathways stretch around the villa for guests to stroll or mountain bike on the gentle Tuscan hills. Tennis courts and two riding stables in the neighbourhood. The villa, whose entrance is decorated with two 17th-century statues representing two lions, is divided into five apartments, all furnished in the typical Tuscan style. 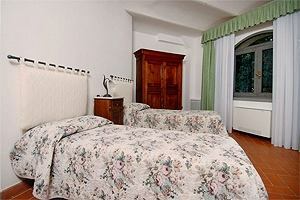 All the apartments are provided with private telephone, satellite TV and Internet connexion and one of them is accessible to disabled people. 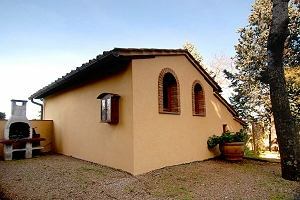 Situated about 20 kilometres from the centre of Florence, the villa is an excellent starting point for trips to Siena, Pisa, San Gimignano, Lucca, Pisa and Volterra. Various renting formulas are possible for groups of 20/22 people. 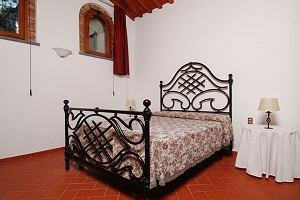 The villa (10 double bedroom, 1 double sofa beds and 8 bathrooms) is divided into five recently renovated apartments of different sizes, furnished in the typical Tuscan style. 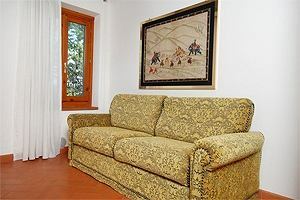 All the apartments are provided with satellite TV, private telephone and Internet connexion and have a small private garden. 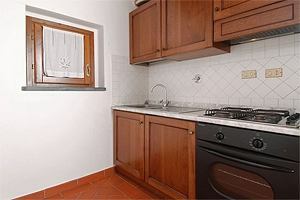 Apartment Niccolò (2+2 beds – 1 double bedroom + double sofa bed and 1 bathroom): it is the smallest apartment (42 m²) and is composed of kitchenette, living room with double sofa bed, 1 double bedroom and 1 bathroom with shower. 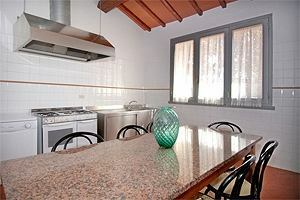 Apartment Caterina (6 beds – 3 double bedrooms and 2 bathrooms): it is on the first floor of the building and covers an area of 80 m². 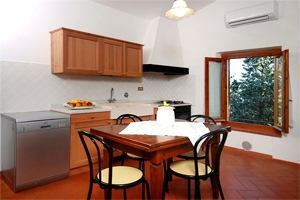 It is composed of a large kitchen equipped with dishwasher and oven, 2 double bedrooms, 1 twin-bedded room and 2 bathrooms with shower. Washing machine in one of the bathrooms. 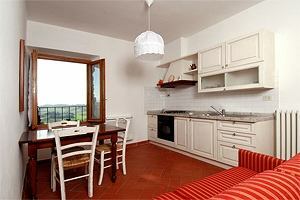 Apartment Marco (4 beds – 2 double bedrooms and 1 bathroom): situated on the second floor, it covers an area of 55 m² and composes of large living room with kitchenette equipped with oven and dishwasher, 2 double bedrooms and 1 bathroom with shower. 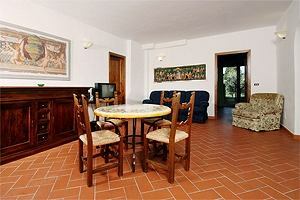 Apartment Sonia (6+2 beds – 3 double bedrooms + double sofa bed and 3 bathrooms): it is the largest apartment of the villa (130 m²), is situated on the ground floor and has three independent entrances. The apartment composes of large kitchen equipped with oven, dishwasher and washing machine, living room with double sofa bed, 1 double bedroom, 2 twin-bedded rooms and 3 bathrooms with shower. The apartment is accessible to disabled people. 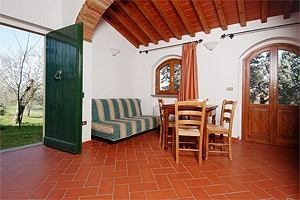 Apartment Piero (2+2 beds – 1 double bedroom + double sofa bed and 1 bathroom): it covers an area of 46 m² on the second floor of the building and is composed of living room with double sofa bed, kitchenette equipped with oven and fridge, 1 double bedroom and 1 bathroom with shower. At guests’ disposal: private 6x12 m swimming pool furnished with sunloungers and sunshades, barbecue equipment, private telephone, satellite TV, Internet connexion, dishwasher and washing machine. One of the apartments is accessible to disabled people. Mountain bike renting service. Tennis club, riding stables and lake for fishing in the neighbourhood. 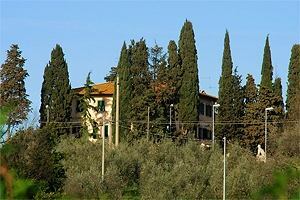 Shops and services are in Montespertoli. 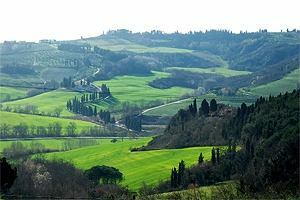 Certaldo 21 km - Florence 20 km - San Gimignano 34 km - Colle Val d`Elsa 36 km - Volterra 54 km - Siena 56 km - Pisa 67 km - Arezzo 85 km. 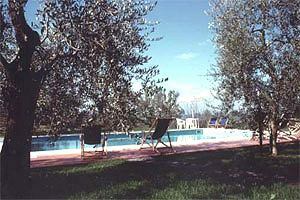 Florence airport 26 km – Pisa airport 68 km - Rome Fiumicino airport 297 km.